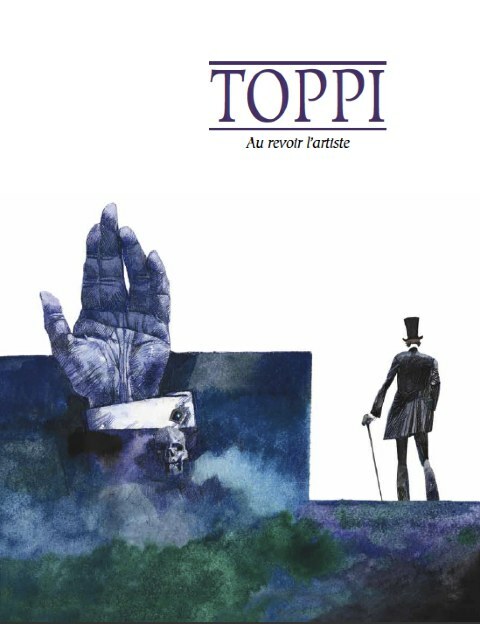 So why is Toppi not better known internationally? It hasn’t helped that so little of his output has been translated, nor that he came to prefer the freedom to create all sorts of separate projects or one-off stories rather than be anchored to one recurring character that might have won him more fame. 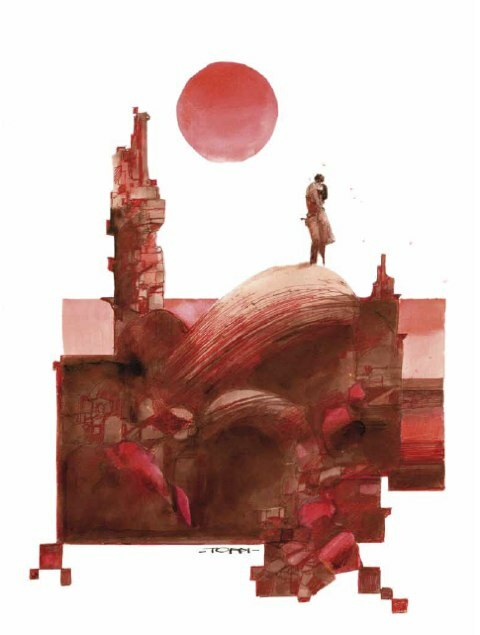 On top of this, his unconventional mature approach to layout and illustration meant that he received few commissions from mainstream American publishers. Toppi’s U.S. credits come to little more than one Sin City pin-up for Miller (below) and five covers for Marvel’s historical sequel 1602: New World, giving us his takes on the Hulk and a cowboy Spider-Man. According to expert David Roach, Toppi did produce around ten strips for the British educational weekly Tell Me Why circa 1969-70 and a couple of his Italian comics were reprinted in Eagle and possibly Tell Me Why annuals during the mid-Seventies, but aside from this Alan Moore portrait for Gary Spencer-Millidge’s tribute book (below), that seems to be all, folks! 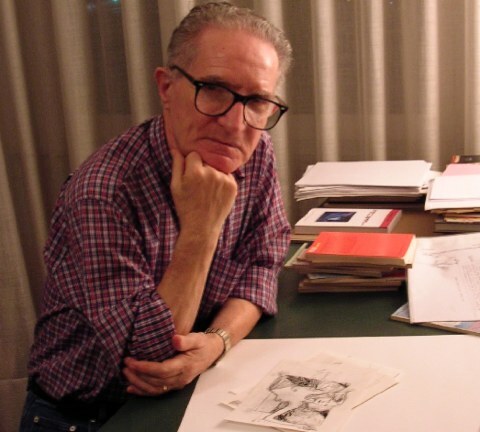 A self-taught artist born in Milan in 1932, Toppi did not begin his professional career as a comic artist but spent much of the Fifties as an illustrator in advertising and animation. He would adapt his drawing to suit commissions, ranging between documentary accuracy notably on educational artwork for children’s encyclopedias, and caricatural cartooning for humorous books given as prizes in promotional campaigns for products, for example starring Calimero, the cute eggshell-headed black chicken. These combined styles suited his first professional comics job in 1960, drawing the magical adventures of Il Mago Zurli (below), single-page episodes based on a popular presenter on kids’ television, in the weekly Il Corriere dei Piccoli, while his thoroughly researched period illustration lent itself to numerous historical stories such as the ‘True Story of Pietro Micca’ scripted by Milo Milani, a biography of the 17th century soldier and Italian national hero who sacrificed himself to defend Turin. 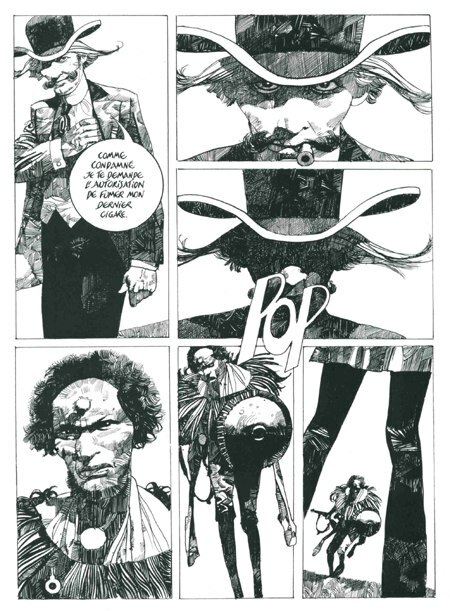 Toppi’s unique artistry gradually emerged, especially when he joined the weekly Messaggero dei ragazzi and was granted more freedom. 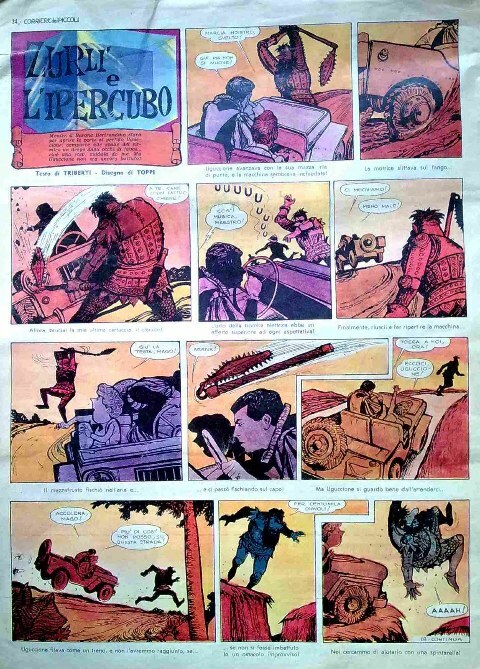 His bravura use of negative space to add potency to areas of white and of characters and other elements breaking out of their ‘boxes’ and disrupting the edges of the panels and pages led to his being awarded the ‘Yellow Kid’ prize for the best Italian comic artist of the year at the International Comics Show in Lucca in 1975. It would be the first of many accolades. 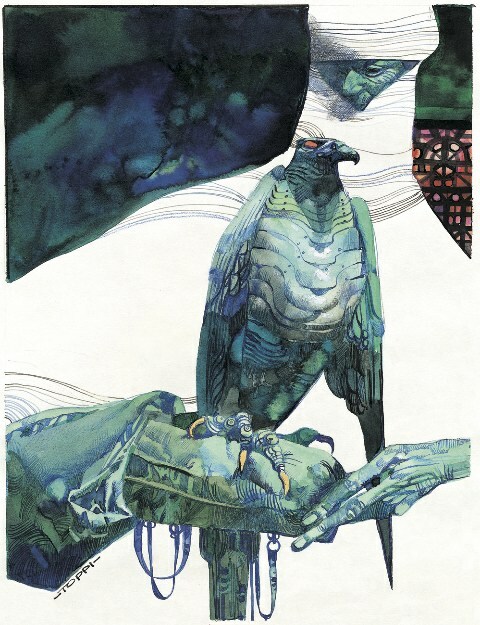 While Toppi’s artistry graced numerous fine one-shot stories, from scripts by others for the pages of Italy’s main anthologies, it became vital for him to take control of the writing. In the experimental monthly Alter Alter he embarked on his personal re-tellings of seven lesser-known tales from The Arabian Nights (sample pages below), narrated by the woman Sharaz-de who must tell a fresh story every night to save her life. 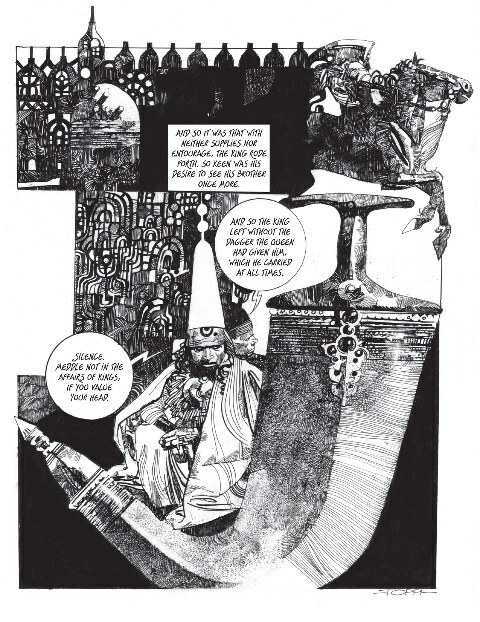 Toppi also joined the high adventure magazine Orient Express, where he devised the intriguing exploits of The Colllector (below), a sly time-traveller in bowler hat and prominent bullhorn moustache, who hunts down fascinating artifacts. 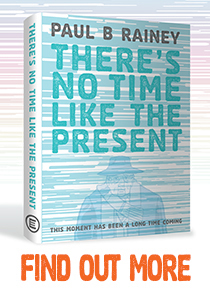 Archaia will release this series in 2013. 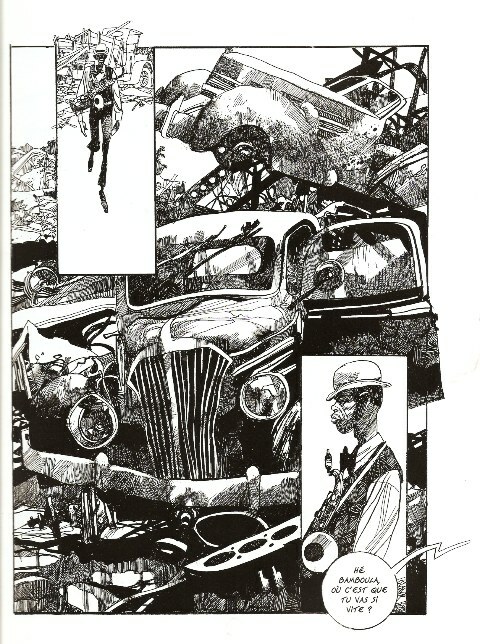 To take one example, his 32-page story ‘Blues’ (above) from the March 1990 issue of Corto Maltese magazine follows a black saxophonist named ‘Honeylips from his faded photograph pinned to the wooden wall of his abandoned shack and back again. The ghost-like musician literally steps out of the photo and across the rugged countryside to a scrap-yard, its wrinkled manager and a disturbed killer. Along the way, any animal or object can become a chorus of commentators, from a weasel, bird and dragonfly to an old mailbox or a broken petrol pump. The boldly designed pages have an uncanny abstract geometry to them. 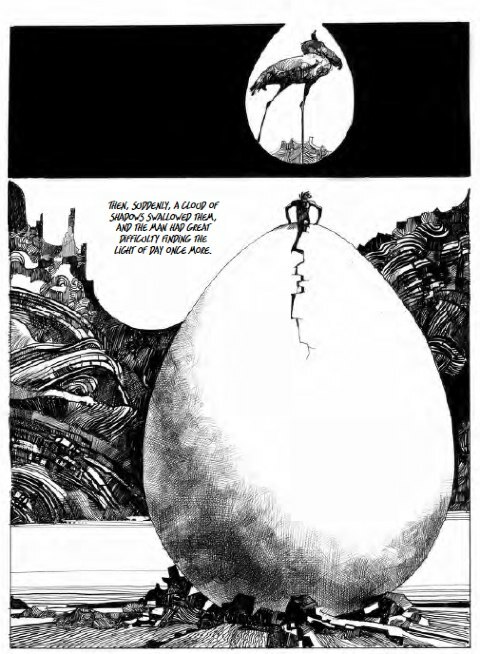 In one full-page panel, the saxophonist is reduced to a small figure top left while most of the page is filled with the locale of a field and two mice perching on grain, while the next page is constructed around a tall telegraph pole stood right in the middle, an example of why Toppi has been hailed as ‘the poet of verticality’. 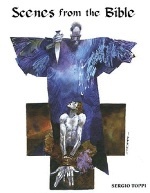 During the early Nineties almost all of Italy’s once-vibrant anthology comics magazines folded, removing a vital market for Toppi’s experimental one-shots. Luckily, the French publisher Mosquito began issuing translations in 1995 and building a fresh readership in France. In 2004 Mosquito started to commission new material from him, such as a sequel to Sharaz-De, a fifth album of The Collector and extra thematic short stories to complete others already made for Italian magazines. Additionally, in 2002 Mosquito introduced books of his illustrations, one of which on Scenes from the Bible is also due from Archaia. 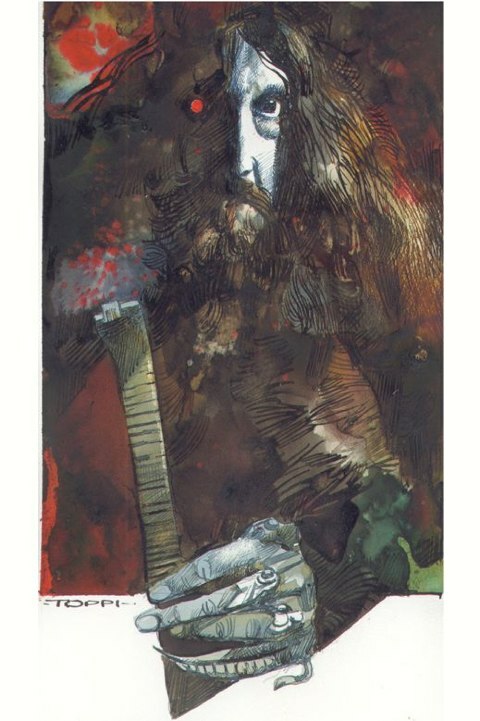 In all, Mosquito have published over thirty books by Toppi, with nearly twenty more planned for the coming years and he is being translated in America, Germany, Spain, The Netherlands, Poland, Serbia and once more in Italy! China has also recently embraced his work. A major touring exhibition opened in Beijing in October 2011 and will tour for three years. 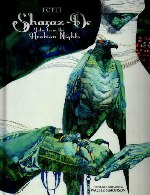 It was shown in May 2012 at the CICAF festival in Hangzhou, visited by two million people in five days, where Toppi won the Golden Monkey Award for comics. 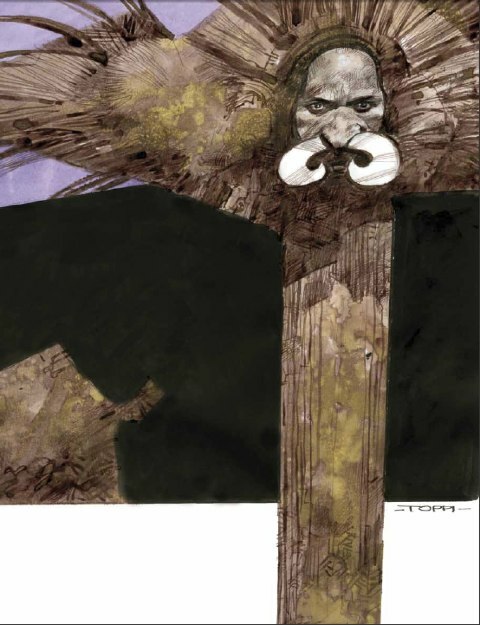 Toppi left behind several unrealised projects, such as illustrating the Finnish Kalevala saga and Mahler’s songs, but he has left us a wealth of wonders in his legacy. Till the end, Toppi was passionate about not repeating himself but always to challenge and renew himself. “My drawing pages are truly battlefields. 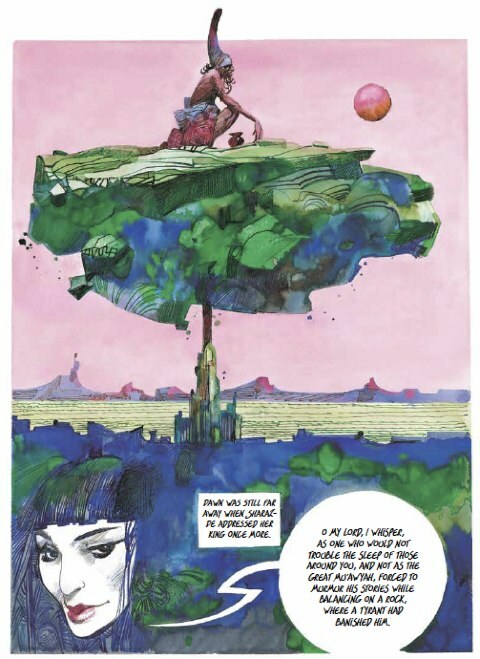 I am fighting against the paper…” Out of these battles, Toppi emerges triumphant.